“We do appreciate all that you do, and we offer you suggestions because we want you to have a more joyous life so that you can spread more joy. It is our desire for you that you give what it is you are strong in, what you consider yourself to be an expert in, to whomever is requesting your help and guidance, your support. You are angels who have come to be of service to one another and it is the fastest way to living the life you have always dreamed of. We want you to know that this is for your highest good. You do not need to save or rescue anyone. You are your own saviors, and that is why we ask you to embody that role. It is impossible for you to assist another without assisting yourself. 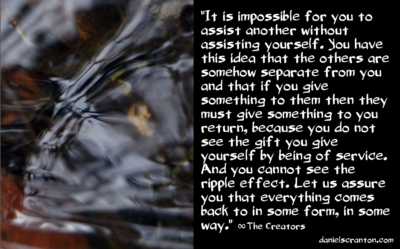 You have this idea that the others are somehow separate from you and that if you give something to them then they must give something to you in return, because you do not see the gift you give yourself by being of service. And you cannot see the ripple effect. Let us assure you that everything comes back to in some form, in some way. You will receive what it is you need when you give freely of what it is you have. Take this offering as our gift to you, for it is our desire to be the best possible version of ourselves that we can be. And we know that this is your desire as well. We know who you are, and we give you exactly what you are ready for. This is the time. You are ready to awaken to your true Selves, your loving, giving, caring, infinite Selves.